As part of my discounted Hong Kong Airlines business class ticket, I had to fly to Bangkok and back. 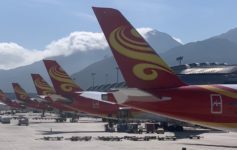 It gave me the chance to test out two more business class seats offered by Hong Kong Airlines. I actually tried to ditch these segments in Hong Kong. There was no reason to go to Bangkok (the Hyatt Regency won’t open until next month) and I just wanted to get home. While I wasn’t optimistic about my chances for success, I figured it would not hurt to ask the ticket counter agent if I could drop my HKG-BKK-HKG segments and just fly back to Los Angeles. My A330-300 on the way down featured similar business class seats to my LAX-HKG flight. The staggered lie-flat beds offered comfort and privacy, though the ~2 hour flight to Bangkok was too short to nap on. The return to Hong Kong was aboard an older A330-300 with 2-2-2 seating in business class. These seats are still used by Singapore Airlines among others and I was still able to enjoy a nap onboard due to the 4:00AM departure time. Breakfast choices included a Chinese noodle dish, scrambled eggs, or crepes. The scrambled eggs were fine, but the hot almond croissant was very tasty. Hong Kong Airlines also offers very decent espresso onboard. I commend Hong Kong Airlines for excellent onboard cuisine, western choices on each flight, and great service and comfort overall. One flight left to Los Angeles: will I end up with the new business class seat? Stay tuned for a full trip report. Looks like very, very cheap industrial yogurt. Nice going, cheap-o classless mainland China (masquerading as HK) airline.